When the director says in interviews that there is no deep meaning to his film and it is only about sharks eating people you know you are not going to be getting Hamlet. 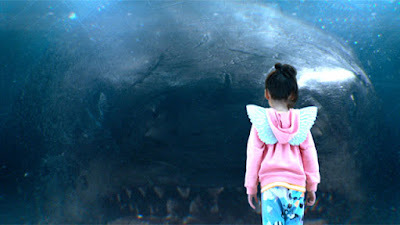 I'm more than fine with that especially when it is a film as fun as THE MEG. It begins on an underwater rescue where Jason Statham is rescuing the crew of a sunken sub. When it begins to go south he realizes that there is something outside the subs. He leaves his two friends behind just as something crushes the sub in trouble. He saved 11 but lost two friends. Five years later Statham is called into service when his ex-wife is in a crippled sub deeper than anyone has ever gone before. It seems a megladon has attacked the sub. He rescues his ex but something has followed them to the surface. High art? Only of the entertaining kind- which is the best kind and as a result I had a great time. Thanks for the review Steve. I come here to find out movies I would not know of otherwise. But sometimes, you just want a dumb giant shark movie. I appreciate it.